Status: Initial phase (ATC-58 Project) commenced in 2001 and was completed in 2007. The ATC-58-1 Project commenced in 2006 and was completed in 2012. ATC-58-2 Project commenced in 2012 with a 5-year duration. 3.1 Performance Assessment Calculation Tool (PACT) Version 3.0 (2016, zip file is ~13 MB) NEW! 3.2 Provided Fragility Data (2016, zip file is ~52 MB) NEW! 3.3 - 3.6 Spreadsheet Tools (2016, zip file is ~5 MB) NEW! 3.7 Technical Background Documentation (2016, zip file is ~118 MB) NEW! 3.8 Structural Background Documentation (2016, zip file is ~80 MB) NEW! 3.9 Nonstructural Background Documentation (2016, zip file is ~70 MB) NEW! FEMA P-58 Volumes 1-4 were originally published in 2012. A revised version of P-58 Volume 3, which contains the Performance Assessment Calculation Tool (PACT) Version 3.0 was published in September 2016. The 2012 version of FEMA P-58 materials is available free of charge from the FEMA warehouse. Participants: To see a list of ATC-58-1 project participants, click here. In 2001, the Applied Technology Council (ATC) was awarded the first in a series of contracts with the Federal Emergency Management Agency (FEMA) to develop Next-Generation Performance-Based Seismic Design Guidelines for New and Existing Buildings. These projects would become known as the ATC-58/ATC-58-1 Projects. The principal product under this combined 10-year work effort was the development of a methodology for seismic performance assessment of individual buildings that properly accounts for uncertainty in our ability to accurately predict response, and communicates performance in ways that better relate to the decision-making needs of stakeholders. The currently ongoing phase of the project (ATC-58-2) is developing performance-based design guidelines and stakeholder guides using the information and materials developed under previous phases of the project. This project completed the development of a methodology for seismic performance assessment of individual buildings in September 2012. The final products are available for download above. The provided volumes together describe the resulting methodology, as well as the development of basic building information, response quantities, fragilities, and consequence data used as inputs to the methodology. To allow practical implementation of the methodology, work included the collection of fragility and consequence data for most common structural systems and building occupancies, and the development of an electronic Performance Assesment Calculation Tool (PACT) for performing the probabilistic computations and accumulation of losses. Volume 1 - Methodology is the fundamental product of this project and presents the general methodology for conducting seismic performance assesments. Volume 2 - Implementation Guide provides guidance on implementing a seismic performance assessment usin the methodology and provides specific instructions on how to assemble and prepare input data necessary for PACT. Readers are cautioned to use this document in conjunction with Volume 1, and not to place complete reliance on Volume 2 alone for guidance on executing the methodology. Volume 3 - Supporting Electronic Materials and Background Documentation consists of a series of electronic products assembled to assist engineers in conducting seismic performance assessments and in understanding the technical basis of the methodology. 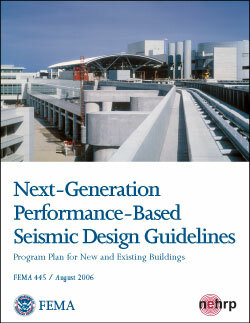 Phase 1 of the project focused on a review and updating of the program plan presented in the FEMA-349 Action Plan for Performance Based Seismic Design, which defines the work necessary to develop the following series of products: Structural Performance Products, Nonstructural Performance Products, Risk Management Products, Design Guidelines, and Stakeholders Guidelines. The principal outcome of the Phase 1 effort was a revised program plan, which was published and released in August 2006 as FEMA 445, Next-Generation Performance-Based Seismic Design Guidelines, Program Plan for New and Existing Buildings. A workshop, funded by FEMA, was conducted on June 18, 2002 in Chicago, Illinois, and is documented in the ATC-58-1 report, Proceedings of FEMA-Sponsored Workshop on Communicating Earthquake Risk. Phase 2 of the project commenced In 2003, focusing on the initial development a methodology for seismic performance assessment of buildings that provides a framework for identifying the probable consequences, in terms of human losses (deaths and serious injuries), direct economic losses (building repair or replacement costs) and indirect losses (time of lost beneficial use of the building for its intended purpose), resulting from building response to ground shaking. Work on Phase 2 was completed in June 2007, with the preparation of the 35% complete draft of the Performance Assessment Guidelines, and a companion electronic Performance Assessment Calculation Tool (PACT). 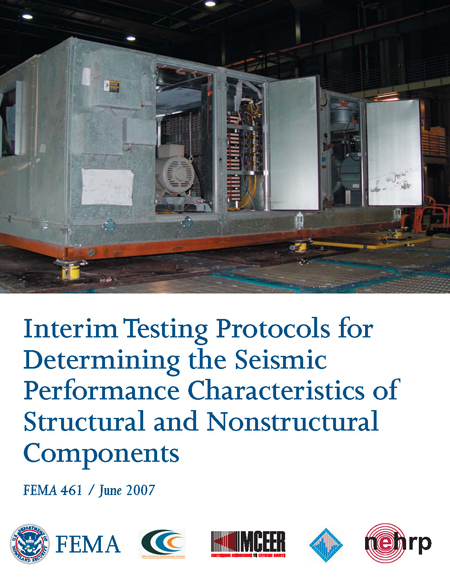 This work also resulted in the development of FEMA 461, Interim Testing Protocols for Determining the Seismic Performance Characteristics of Structural and Nonstructural Components, published and released in June 2007. The National Science Foundation (NSF) George E. Brown, Jr., Network for Earthquake Engineering Simulation (NEES) is funding the NEES Nonstructural Grand Challenge project studying the seismic performance of nonstructural systems including integrated ceiling systems, piping systems, and partitions. Information from this project has been incorporated into the developing methodology for seismic performance assessment of buildings.